In addition to having one of the most unusual names, Antirrhinum braun-blanquetii, is also unusual in that it is one of the few hardy perennial species of snapdragon. Named for Josias Braun-Blanquet the influential 20th century Swiss botanist, it is native to Northern Spain and Portugal. The plants are bushier than the annual snapdragon, and are truly spectacular from the second year. 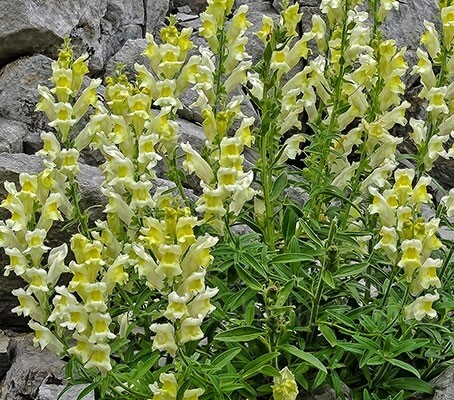 They will bloom the first year from seed producing numerous spikes from which large blooms of creamy-white snapdragons with delicate yellow throats appear in summer. 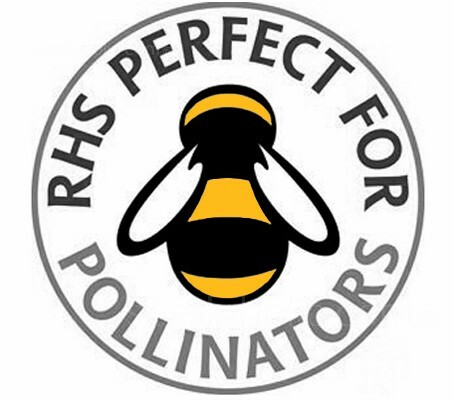 The flowers are beloved by bees and other pollinating insects. Start the seeds early indoors in spring, eight weeks before the last frost date, or sow directly outdoors in late spring. Its candelabra shape, naturally branching habit and very long flowering period make this trouble-free snapdragon ideal for the middle of a border or large container. Sow January to May under glass in gentle heat for flowers June to October. Or sow July to September in a cold frame for planting out in the garden the following spring. Sow at temperatures between 15 to 20°C (59 to 68°F). Sow on the surface of a good free draining, damp seed compost. Place the trays or pots in a propagator or seal container inside a polythene bag until after germination which usually takes 10 to 21 days. Do not exclude light or cover the seed as this helps germination. Keep the germinating seedlings moist at all times, remembering to water the soil only and keep water off the leaves. The plants need a very well drained soil that is rich in organic matter. Pinch back your snapdragons when they are a few inches tall to encourage branching, and remove old flowers after they have bloomed to encourage further blooming. Antirrhinum braun-blanquetii is native to areas of Northwestern Spain, Northeastern Portugal where it inhabits alpine steppes and rocky slopes. 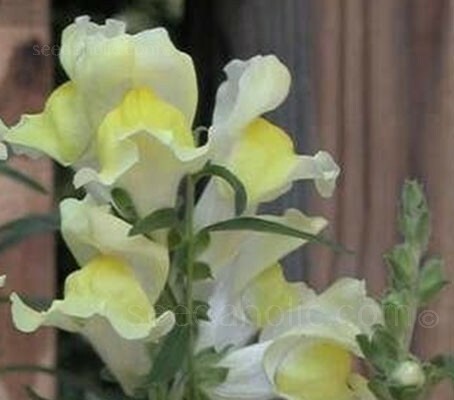 Snapdragons are easy to grow and have a long been used in gardens and in the cut flower industry. The brightly coloured blossoms can also be used to dye cloth. Snapdragons perform best in cooler weather and most cultivars can tolerate frost and an occasional light freeze. They don't do well in summer heat, and in hot areas, snapdragons are grown in the winter. Snapdragons belong to the Scrophulariaceae, or figwort, family. There are more than 3000 species in the family; common relatives include Foxglove, Veronica, Penstemon and Calceolaria. This species is named for Josias Braun-Blanquet the influential 20th century Swiss botanist. This species A. braun-blanquetii is commonly referred to as the Hardy Snapdragon or the Perennial Snapdragon. Josias Braun-Blanquet was born in Chur, Switzerland in 1884, he died in Montpellier, France in 1980. Considered one of the most influential botanists until today, he was leader of the Zurich-Montpellier school of plant sociology - itself the leading twentieth century European school of plant ecology, and established the modern way of classifying vegetation according to floristic composition. Braun-Blanquet solidified his dominance through his book Pflanzensoziologie, a classic title first published in 1928, it went through two later new editions into the 1960s. 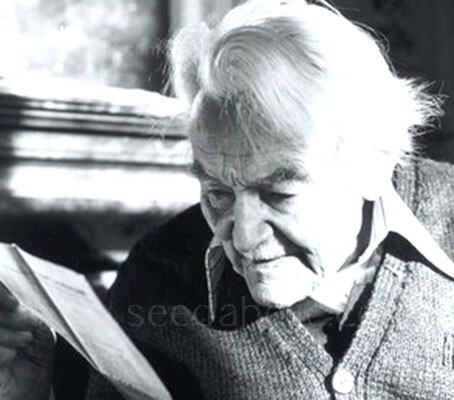 In 1974 he was awarded the gold medal of the Linnean Society of London. Sow at anytime of year.